I am not convinced how can more money by contributors in CPF be burdening the system. While the return of CPF is higher than fixed deposits or bonds, the money is locked almost permanently, well you get what i meant. I spoke to a CEO of an insurance agency before and he says that he does not even try to sell private annuities because there isn't any out there that is stronger than CPF LIFE. The returns from private annuities simply cannot match CPF LIFE's. CPF LIFE is not commercially viable. CPF LIFE exists largely because of government intervention. If a product is not commercially viable, it is a burden to the provider. For people with more money, once they have maxed out their CPF membership benefits, they can always get private annuities to supplement CPF LIFE if they like. CPF LIFE is a part of CPF's strategy to help all members achieve a basic level of retirement adequacy. All CPF members should take full advantage of this. CPF LIFE is a basic safety net. CPF LIFE will help in ensuring retirement adequacy for all members and there should be no argument about this. CPF LIFE aside, paying 4% to 6% interest for savings in the CPF-MA, CPF-SA and CPF-RA is a huge burden. Even paying 2.5% per annum for our CPF-OA savings could be considered a burden to the system because our AAA rated Singapore government is probably able to access cheaper funds. This could change in future, of course. If we have more money, we have to look elsewhere to stash it. I am sure insurance companies will welcome our money but I am not sure they will be able to guarantee a return of 4% per annum. These days, such a guarantee would be quite a burden. 1. Is AK right 6x out of 10x? 2. REITs and rights: Good at right price. If the rich all kiam kana like some of us here, don't think there'll be much to discuss about stocks & REITs on SGX sia hahaha!!! Who are the rich people here who kiam plenty plenty har? CPF interest is not guaranteed but so far it doesn't really fluctuate. The CPF interest rates have been affirmed every six months for years. I believe the government is waiting for the 10 year bond's coupon to catch up before allowing the CPF interest rates to float. Haha AK :) .... OK, ok you're doing your part! Heehee! Many overestimate their ability to fund their retirement for a prolonged period. This is what longevity risk means. This is the risk which annuities are meant to address. My parents are retired, have RA and drawing a little from it each month. Can I top it up and increase the payout? does it make sense? thanks! Yes, you can top up your parents' CPF-RA. 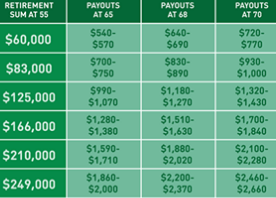 More in the CPF-RA means more interest income. 6% on the first $30K. 5% on the second $30K. Boost elderly parents' RA or MA? many look at their kids for financial support, in a very traditional view. but times & tides changes.